sassyfrazz: Enter to win a $5,000 green home makeover! ~ Seventh Generation Review & Giveaway!! Enter to win a $5,000 green home makeover! ~ Seventh Generation Review & Giveaway!! Seventh Generation, a product line of natural cleaning products, is hosting a "Search for Mother Nature contest" which you will have the opportunity to win a $5,000 green home makeover!! The contest, which runs from now until May 31, asks you to nominate your “Mother Nature,” a person that has been inspirational to you by making their home, community and/or environment safer and healthier. The grand prize winner will be awarded a $5,000 green home makeover and both the nominated “Mother Nature” and the grand prize winner will receive a year's supply of Seventh Generation products. IN addition, a $2,500 donation will be made in our “Mother Nature's” name to an organization working to make the world a safer place. Six finalists will also receive a year's worth of Seventh Generation products to help them protect their planet home. To enter the contest, visit SeventhGeneration.com/mothernature and write in 1000 characters or less about the person who’s inspired you to protect your own Planet Home. Share their story and how they’ve led by example and shown you the way to a safer family and healthier planet. Seventh Generation’s own Mother Nature inspiration, Ivette Melendez of Women’s Action to Gain Economic Security (WAGES), will be a judge of the contest. Rule 1: Go Top-to-Bottom. Whether it's a room or a bookcase, clean from the top to the bottom and you won't have to go back and pick up any stray dirt or errant dust that falls as you go. Rule 2: Go Back to Front. Always clean from back to front for similar reasons. If it's a room, start in a rear corner and work toward the door. If it's a cabinet, begin in the back and clean out toward the edge. Rule 3: Work Clockwise. Pick a starting spot and work in a steady clockwise direction. Working systematically in this way will ensure that you don’t forget anything and won’t have to spend any time thinking about it! Rule 4: Don't Use or Do More Than You Need To. Always start with a small amount of cleaning product and use more as necessary for tough spots and other challenges. Using more than you need to start only creates more work when it's time to rinse everything off! Rule 5: Look Before You Leap. If you're cleaning something you've never cleaned before and/or using a product for the first time, you'll save a lot of premature hair loss by always testing things first to make sure you won't cause any damage. Oven cleaners are among the most hazardous available, and heat intensifies their toxicity. Make ovens sparkle by first wiping them down to remove loose material. Spray on Seventh Generation Natural All Purpose Cleaner and add a light sprinkling of baking soda if you've got serious baked-on grime. Wipe everything clean after a 5-minute soak, and use a final vinegar wipe to make it all gleam. Watch the expert at work! Plus, I love that Seventh Generation products don't have horrible smells, and their products are not toxic. The Microwave. Toxic cleaner residues in the microwave can contaminate any foods that follow. Clean yours with Seventh Generation Natural All Purpose Cleaner and rinse with vinegar to keep these hazards off the menu. Watch the expert at work! The Cutting Board. Wooden cutting boards often harbor dangerous bacteria, but did you know that they can also absorb the chemicals from conventional cleaning products? In order to keep toxic ingredients away from food surfaces, clean your cutting board naturally with Seventh Generation Natural Dish Liquid and follow up with a vinegar rinse. Stainless Steel. Skip the specialized products and clean stainless steel surfaces by applying Seventh Generation Natural All-Purpose Cleaner to a microfiber cloth. Use the cloth to scrub then wipe with the grain in one steady direction. Watch the expert at work! Windows. Make short work of this housekeeping headache by first removing spots, grease, and stickers (moisten with Seventh Generation Natural All-Purpose Cleaner and scrape off stickers with a spatula). When dry, spray on Seventh Generation Natural Glass & Surface Cleaner. Wipe in one direction only with a rag, microfiber cloth or recycled paper towel—not newspaper (it's better to recycle the newspaper!). Watch the expert at work! 1) Let vinegar become your elixir of happiness. Mix 1 part white vinegar to 3 parts water. a. Shine a hardwood floor. For large areas, dip your mop. For smaller surfaces, apply from a spray bottle. b. Bring shine to wood furniture. Spray a cotton or microfiber cloth and rub along the grain. For occasional conditioning try a mineral or olive oil rub. c. Remove smudges from glass. Spray the mixture onto a cloth. Wipe in just one direction. Cloth-dry for extra shine. 2) Get a grip on your flat head screwdriver. a. Get into appliance crevices. Cover the tip with a cloth. Slide in one direction. b. Reach nooks and crannies of shower frames or fridge seals. Cover the tip with a cloth. Inch the cloth to a clean spot after each wipe. c. Remove faucets and light switch panels. For a deep cleaning, use the screwdriver to remove small fixtures. Always keep the screwdriver dry. d. Lift gum or stickers. Wet what’s stuck. With even strokes, carefully scrape one direction using a spatula or screwdriver. Uneven pressure may result in scratches. 3) Let your baking soda do the talking. a. Maintain troublesome drains weekly. Remove hair or blockages. Pour in 1 cup baking soda. Add 1 cup vinegar. Watch for happy bubbles. Rinse with hot water. Repeat if necessary. b. Clean the oven. Wipe out loose detritus. Lightly dampen the entire area with a soapy water spray (if it’s too wet, it won’t work). Lightly sprinkle the entire surface with baking soda. Leave for 7 minutes. Scrape with a metal spatula from side to side. Then scrub soap and water using a plastic scouring pad or brush. For a clean smell and a nice shine, wipe the oven with the 1:3 vinegar solution. c. Rub out rust. Make a paste of soda with a few drops of soap and leave for a few minutes. Apply it to a dry rusty spot. Rub in small circles with a wet pumice stone. Repeat if necessary. I was so surprised at some of these tips~ how easy they are and how naturally we can clean our homes! 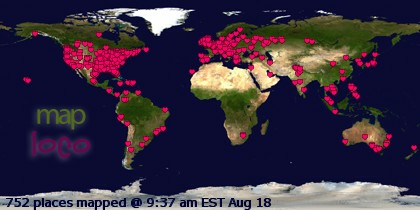 I was really excited to get this information from Seventh Generation, and share them with my readers. I think that using more natural products to clean our home is not only safer but more economical! Seventh Generation products are natural, and safe to our health! I am also hosting a giveaway through this blog posting!! 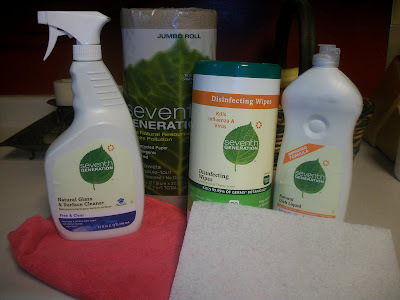 Seventh Generation sent me a kit of their products to test out some of Ivette's cleaning tips. I can't wait to clean my oven. I don't know if other people let that appliance go a long time without cleaning it, but it does get neglected in our home. The main reason I don't clean it that often, is because the cleaner is so toxic smelling and I can't clean it with my children around. Well, using the Seventh Generation all-purpose spray, vinegar and baking soda will make my home a lot safer for breathing, and the chemicals are not harsh on my appliances. The Seventh Generation all-purpose spray is great for so many different surfaces and uses...it really is great all-over in general. I love the Seventh Generation paper towels, 100% recycled...and safe. I also really like the dish liquid from Seventh Generation, it cleans great, and it gentle on my sensitive skin. I like using the disinfecting wipes for cleaning off toys, chairs, tables, and surfaces. I like knowing I am wiping off germs and bacteria, and not leaving behind poisons. You can enter to win the kit that I got to review: Ivette's top cleaning tools, Seventh Generations: disinfecting wipes, all-purpose spray, dish liquid, and paper towels. To qualify, go to Seventh Generation's website, and enter to win the $5,000 green home makeover (and comment about it). This contest is open to non-bloggers and bloggers of the United States and will end on May 27th, 2010. Seventh Generation is committed to being the most trusted brand of household and personal-care products for your living home. Our products are healthy and safe for the air, the surfaces, the fabrics, the pets, and the people within your home -- and for the community and environment outside of it. Seventh Generation also offers products for baby that are safe for your children and the planet. For information on Seventh Generation cleaning, paper, baby and feminine personal care products, to find store locations, and explore the company's website visit: SeventhGeneration.com. I was contacted directly from Seventh Generation to do a product review of their select products. They sent me free product in return for a review and promotion. I was also able to host a giveaway for my readers, sponsored from Seventh Generation. I was not compensated for my time or written review. I went to the Seventh Generation website and entered the green home makeover contest. I wrote about a women named Patty Moreno known as "Garden Girl" who inspired me to compost my table scraps, give up water bottles, buy a rain barrel collector, and try growing my own flowers and vegetables. Patty Moreno is one of the forces behind the concept of Urban Sustainable Living.